SHAME ON ALL THOSE PUBLIC SERVANTS WHO HAVE NEGLECTED THEIR RESPONSIBILITIES TO THE TAXPAYER THEY ARE TO SERVE. Just another one in a long list. 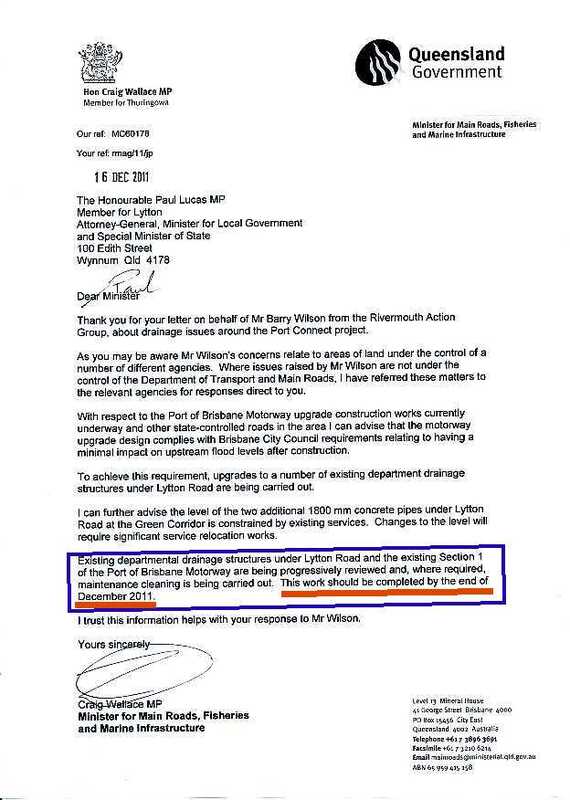 I asked for a meeting with the Queensland Transport engineer and hydrologist involved with the Port Road development in April 2011. My many request were ignored. Did the hydrologist involved ever visit this area and see for themselves or was it just another desk top study at night FROM A STREET DIRECTORY with the lights turned off over 15 years? 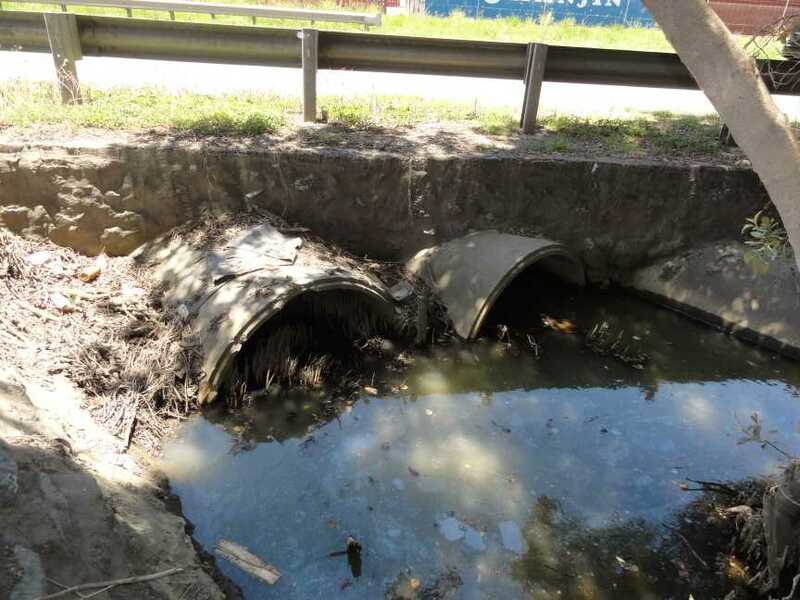 Hemmant Drainage Channel (MAIN DRAIN) from Port Road to Bulimba Creek. 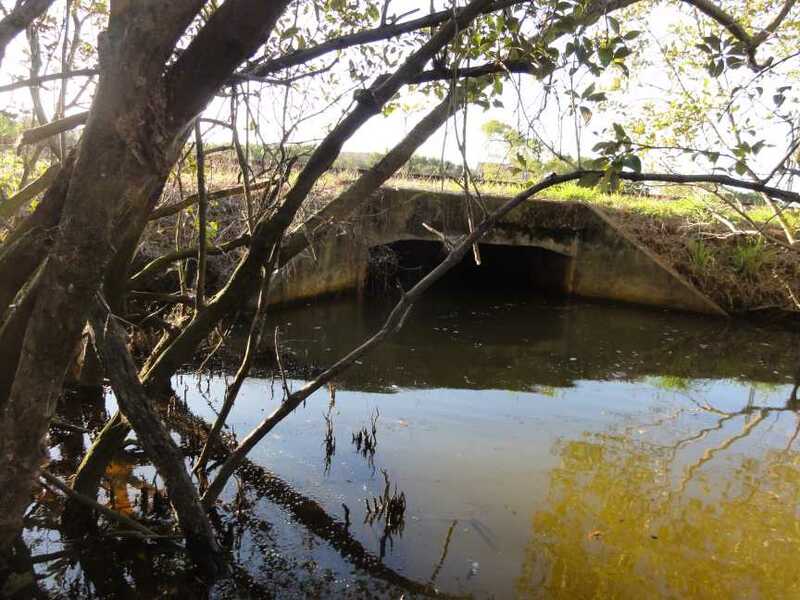 Keep in mind whilst looking at the following photographs that this drainage channel has been altered, restricted and not maintained since 1930's (most probably). When I was young and can still remember about the early 1950s this creek had a flood gates. 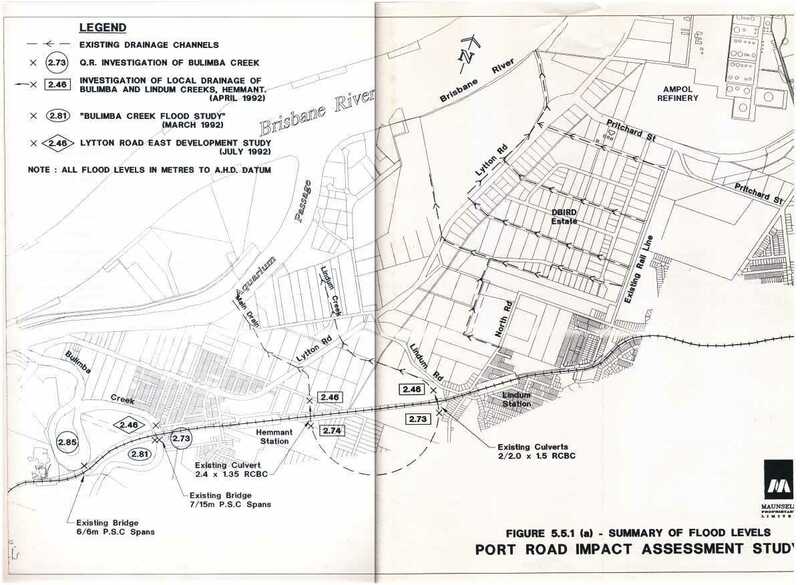 They were on the Bulimba Creek side of what is now called Gosport Street to keep tidal salt water from entering the fresh water wetlands it was intended to drain. This rail line had a wooden bridge structure at this drainage point which has been replaced with concrete culverts most probably when the dual gauge rail line was built. The flow past the rail line is now massively reduced. This rail line changed the natural flow capacity of Bulimba Creek as did local roads and the upgrade of Lytton Road near 50 years ago. 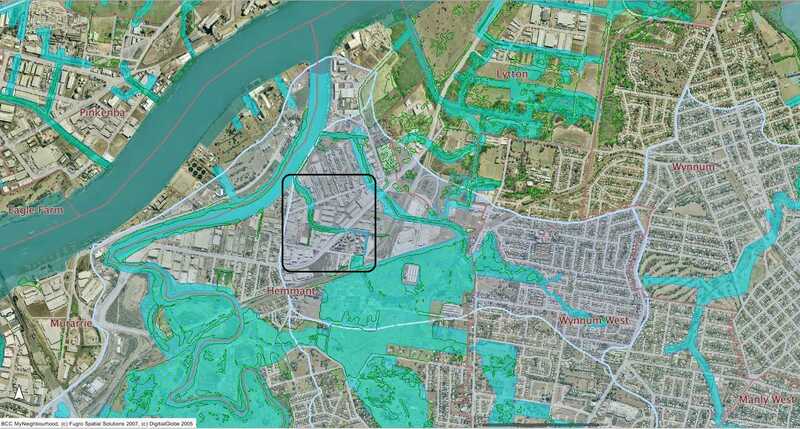 Since that time massive amounts of fill have been placed downstream of the rail line for industrial development and the original flood plain has disappeared beneath buildings. 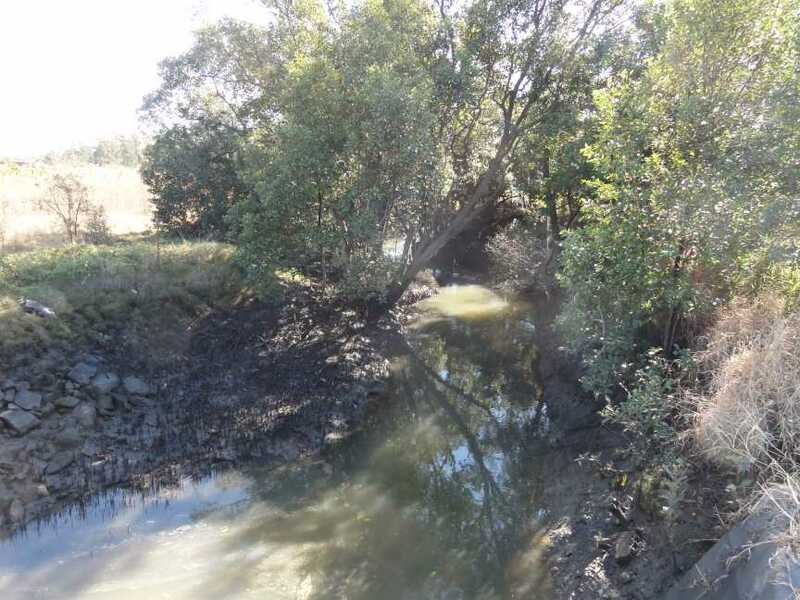 Apparently no drainage channels were resumed by Brisbane City Council or State Government to allow for ongoing maintenance requirements as the upstream catchment is overdeveloped. 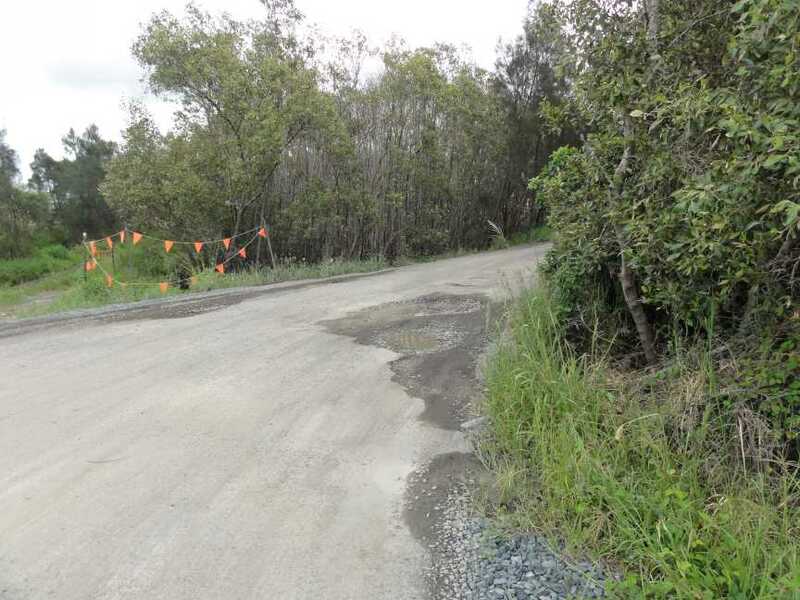 More and more up stream catchment development is being carried out yet no increase or maintenance of downstream drainage is carried out by QRail, Queensland Transport / Main Roads & local council. 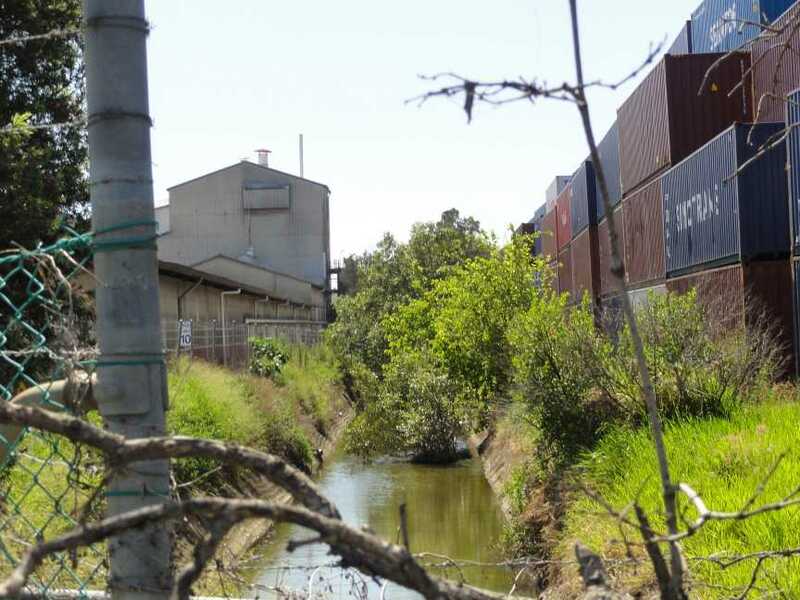 Queensland Rail is required by LAW to maintain drainage under its rail lines as to not increase upstream flooding. 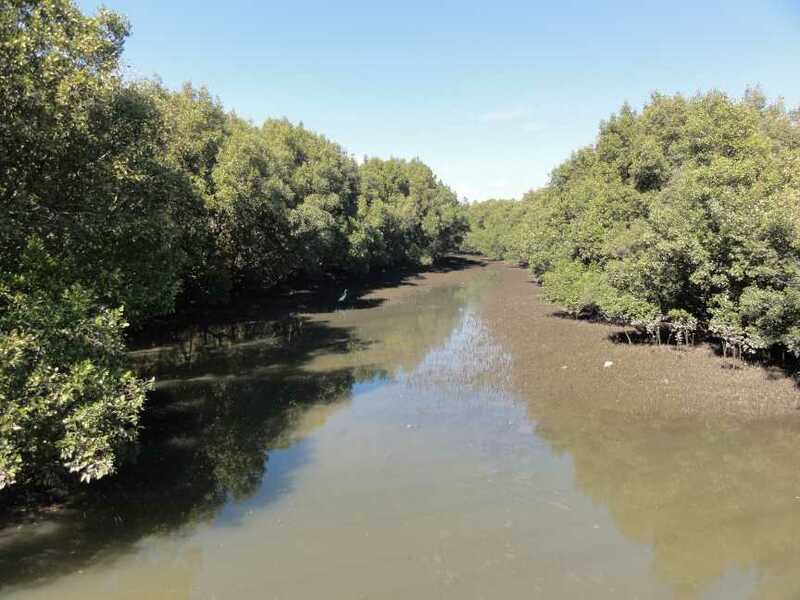 What Act in 1995 did the Queensland's Parliament Pass about QRail responsibilities for drainage? The red arrows have been added to show the width of the drainage channel prior to May 1992. The drainage channel is shown wider that 30 metres at Canberra Street as each allotment shown is about 10 metres wide. 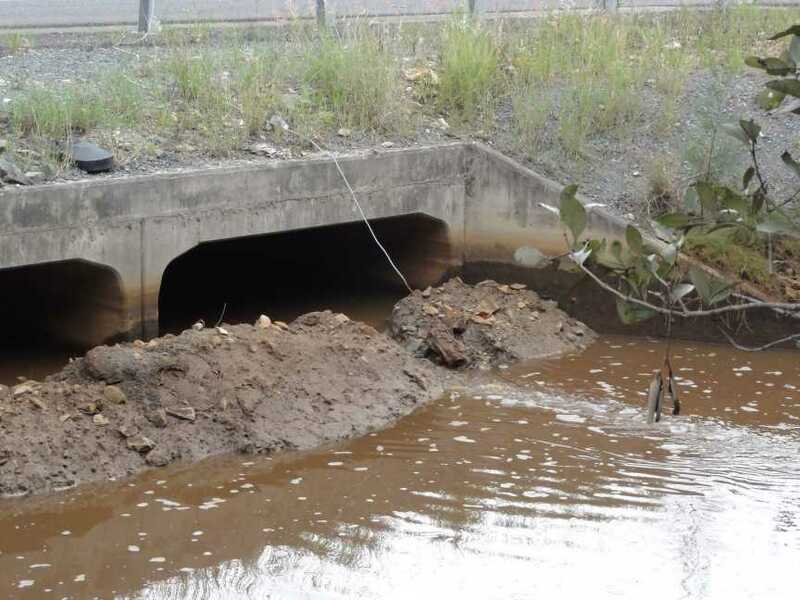 Yet Queensland Rail chose to only place a 2.600 metre culvert under the Rail Line at this point as shown below. Proposed: Additional 1x3000x1800 box culverts. October 1995 Draft Final Report. 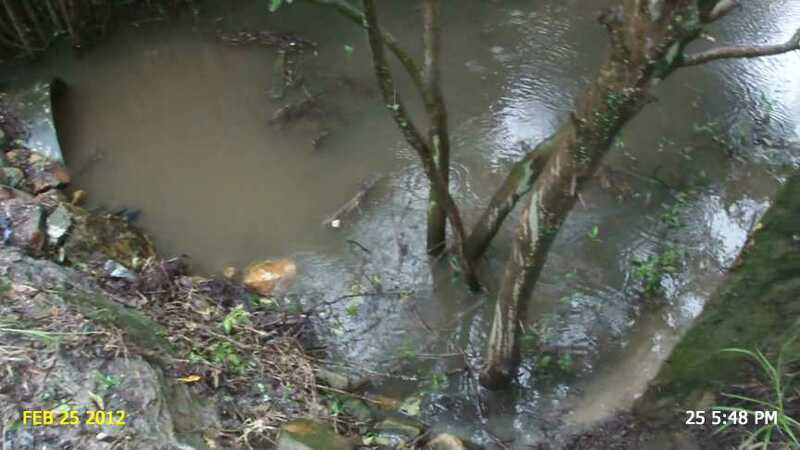 How does this storm water/flood water flow to Bulimba Creek? 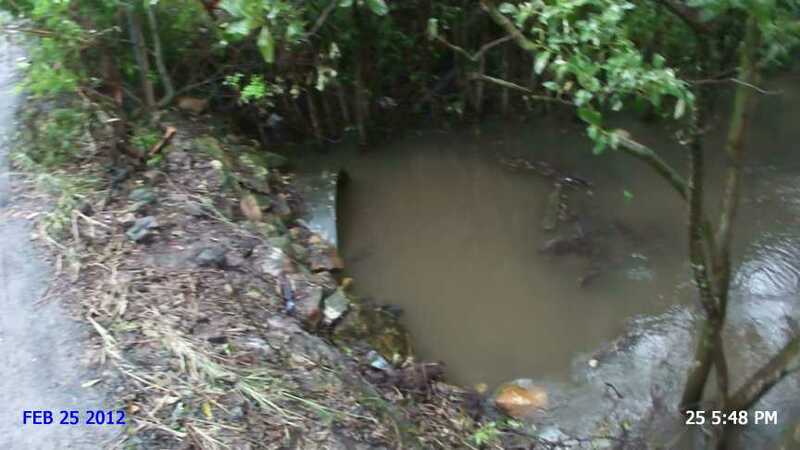 It need to pass through a mangrove area between the Port Road and Canberra Street where there is a one meter pipe through under Canberra Street. 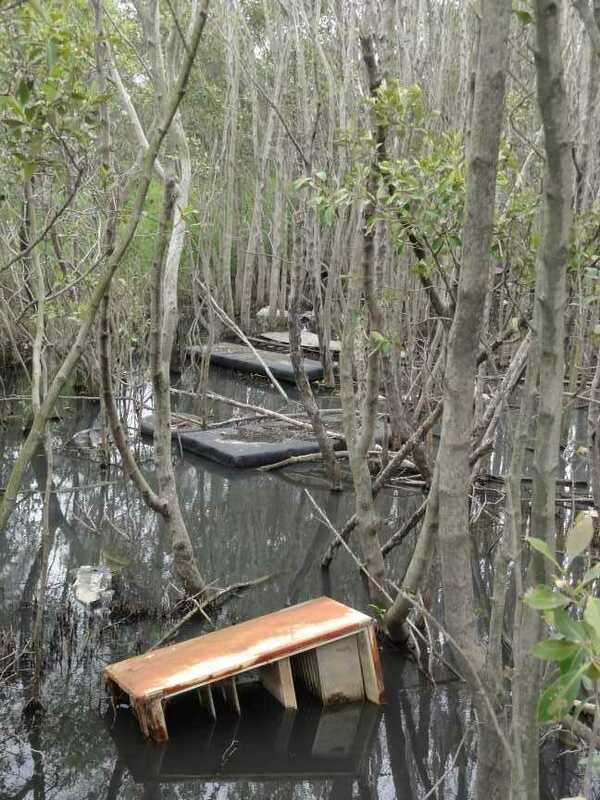 But wait the mangrove area is silted up and owned by QUEENSLAND TRANSPORT. On the day before the King Tide on 11 January 2013 I made a video of the oncoming tide at what should have been the peak of the tide at 9:45 am. 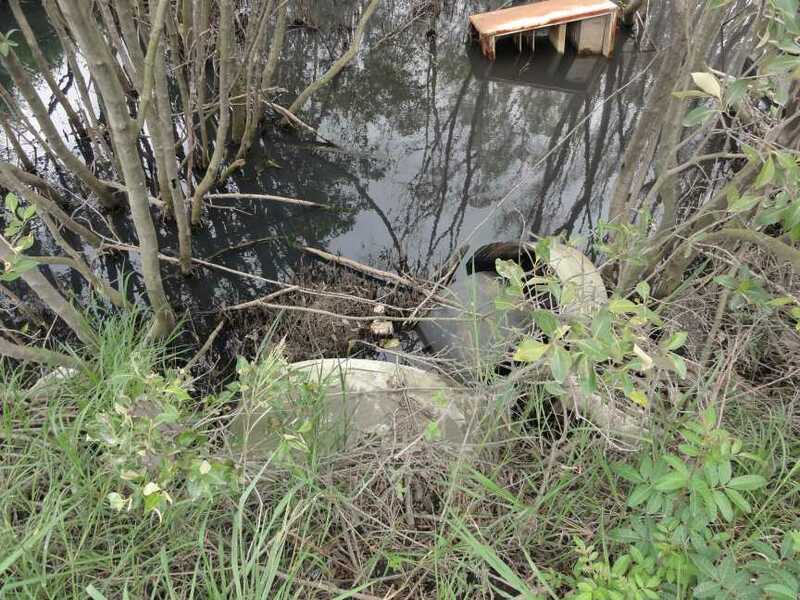 The incoming tide was just a little more that trickling into this depression adjacient to the Port Road box culverts. Press to view the video of 36 seconds at 1.7 megabytes in size. "The ATC South area is adjacent to the Brisbane River and a number of waterway corridors. waterways via private drainage channels. public trunk drainage system to convey stormwater to the River. 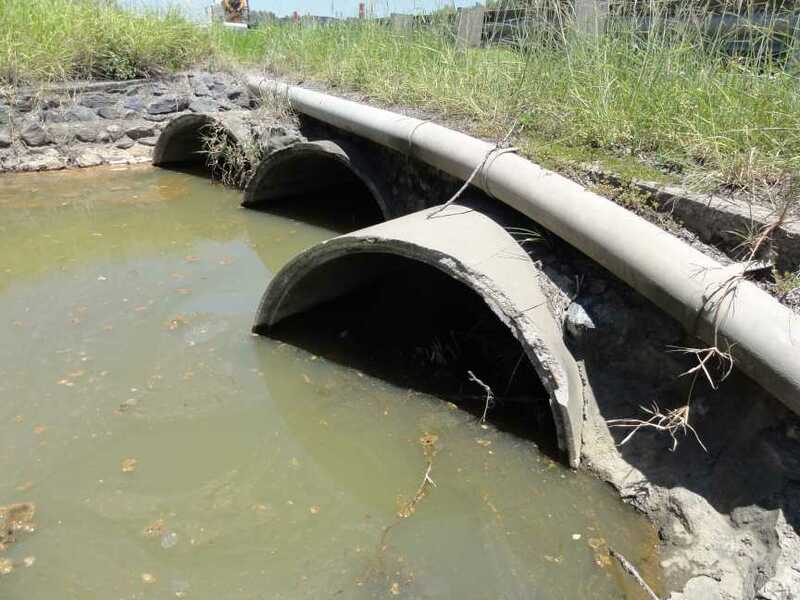 These drains are identified in Map 5.
conveying existing Q100 flood flows." 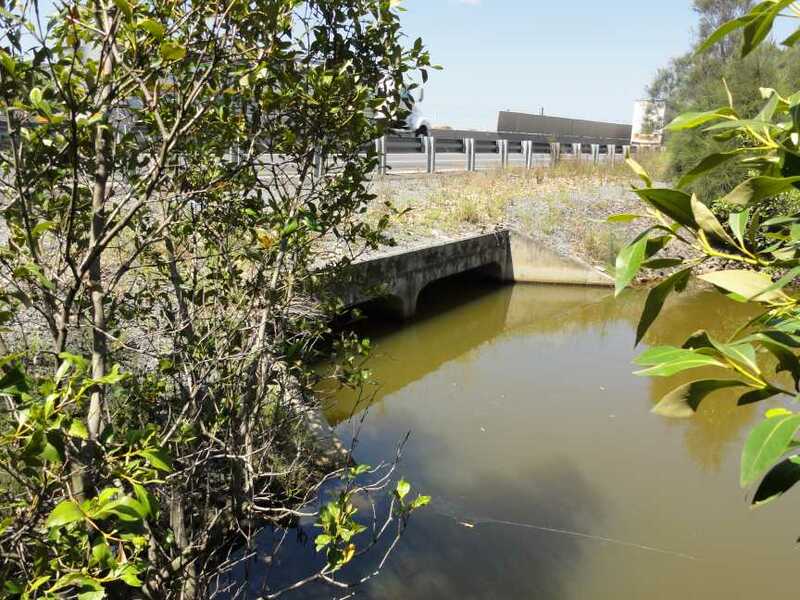 I was under the impression that Hemmant Creek started near the cnr of Manly Road and Kianawah Road South. (Hargraves Road) Manly West. 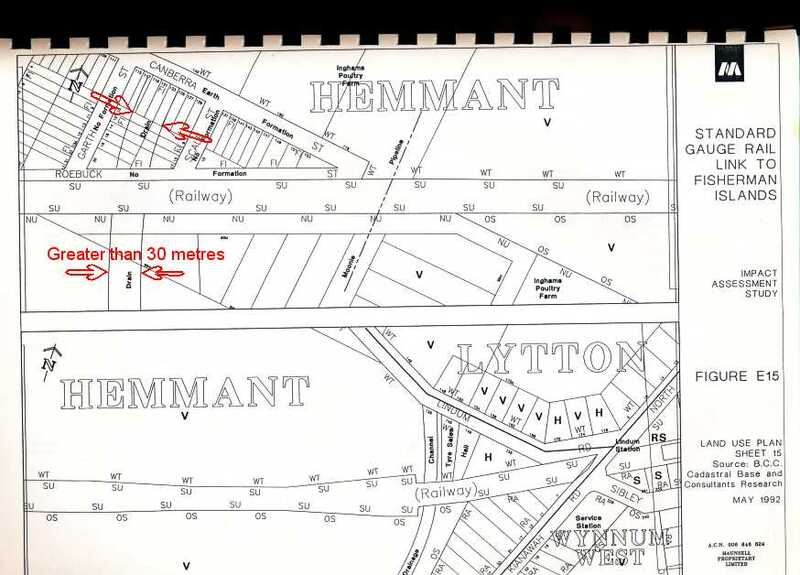 According to the text above this map below Hemmant Creek is east of Hemmant Station and flows to Bulimba Creek via Lytton Road and Gosport Street. 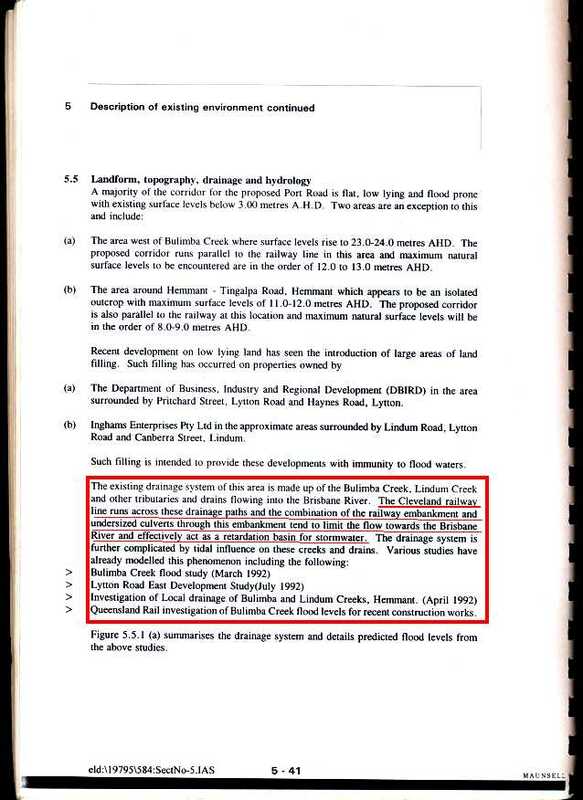 Also the BCC should note that where their map below says it is Mayne Nickless Catchment is actually Main Drain catchment but it has a restricted flow path to Bulimba Creek. 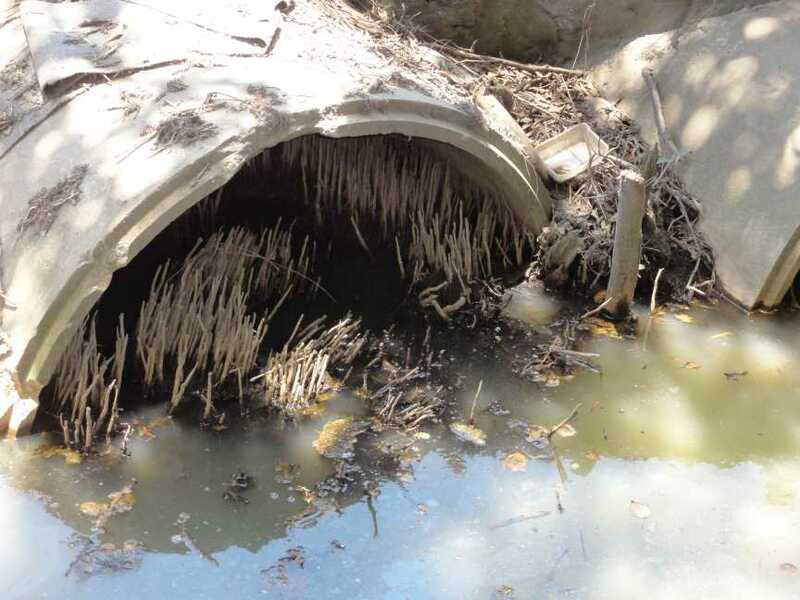 It is obvious that different reports have different names for the same creek or drain. Obviously the authors never visited the area and other who read the reports have no idea what they are about. This may explain why this drainage problem has existed for so long. After reading other BCC reports all of the upstream catchment work is to take place first and the residents in the lower catchment will be last to have any drainage work undertaken. Upstream housing development first downstream drainage last. Just flood them out. Good one BCC. 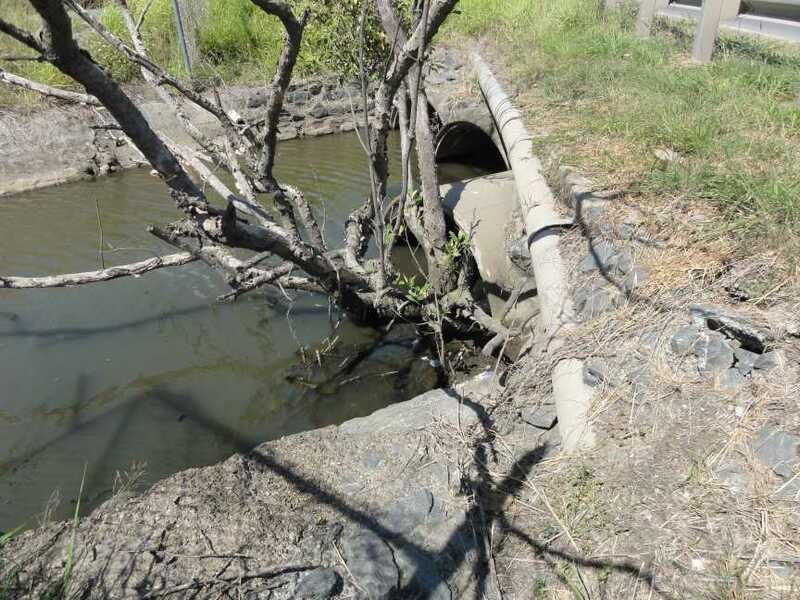 What remains unexplained is the need to upgrade the culverts beneath Lytton Road at Hemmant (near Canberra Street)(The first item in the table above) Why they need to be upgraded and not the drainage channel around the Container park and the undersized culvert (only 1.05m diameter) beneath Canberra Street on Queensland Transport Land. Not to forget the undersized box culvert under the rail line. After reading the BCC report above this 1 metre pipe is capable of carrying Q100 flood flows????????? 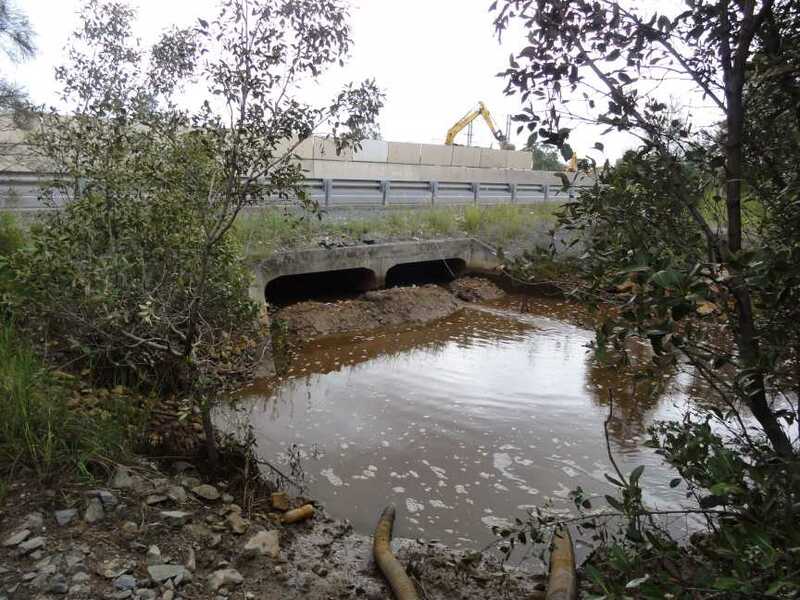 The alternate flow path towards Lindum Creek has a 1.2 m high road across the entire drainage channel with only one 45 cm and one 30 cm pipes beneath the road. Photo 25 February 2012 during rain periods. 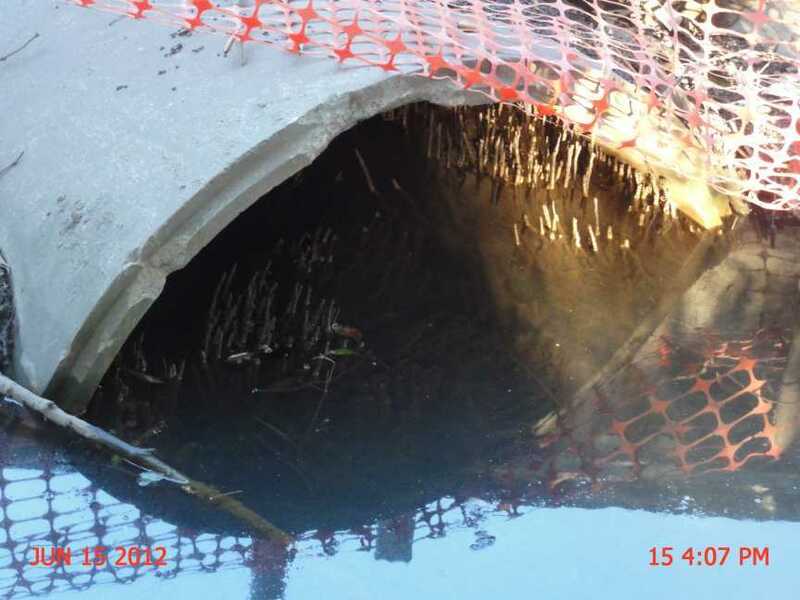 This pipe culvert is approximately 1 metre in diameter. Canberra St (eastern end) with limited drainage beneath and that is half blocked with silt and mangroves TMR owned land. 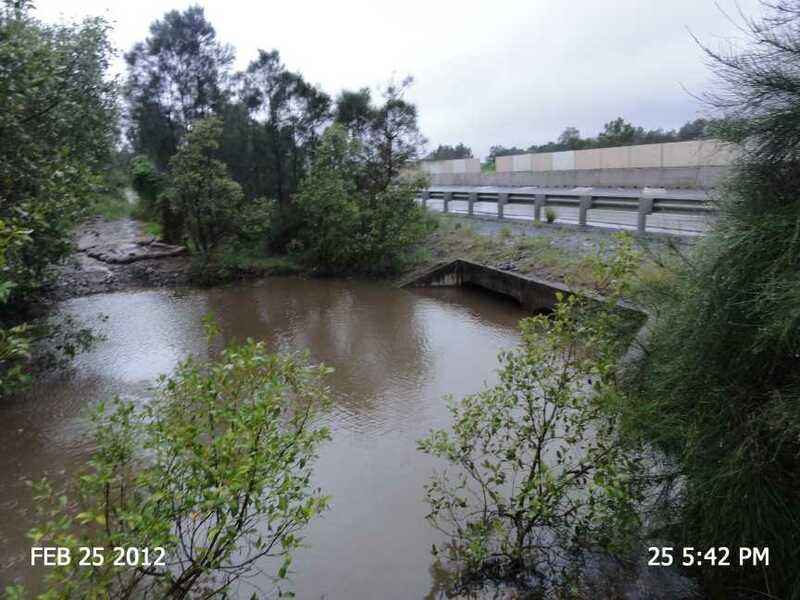 Another view of the culvert downstream of Canberra St as above. 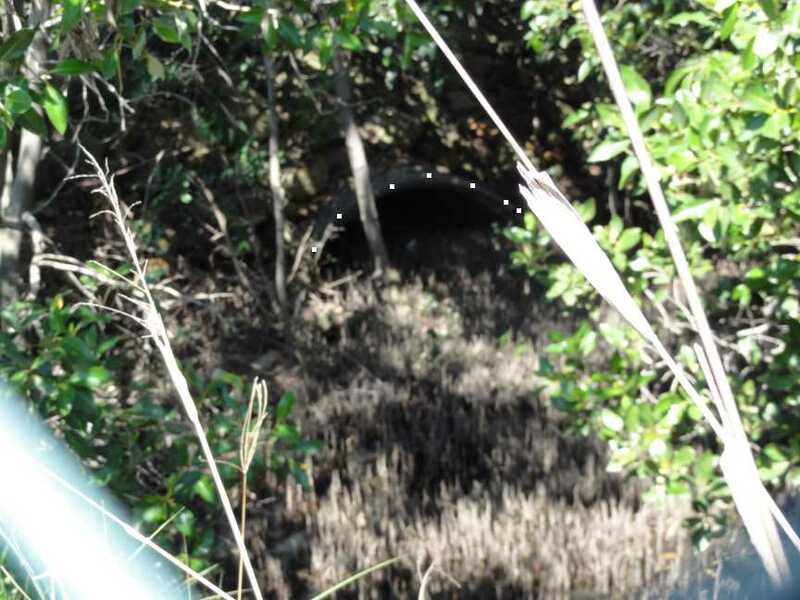 Note the mangroves and silt inside of this single drainage pipe. 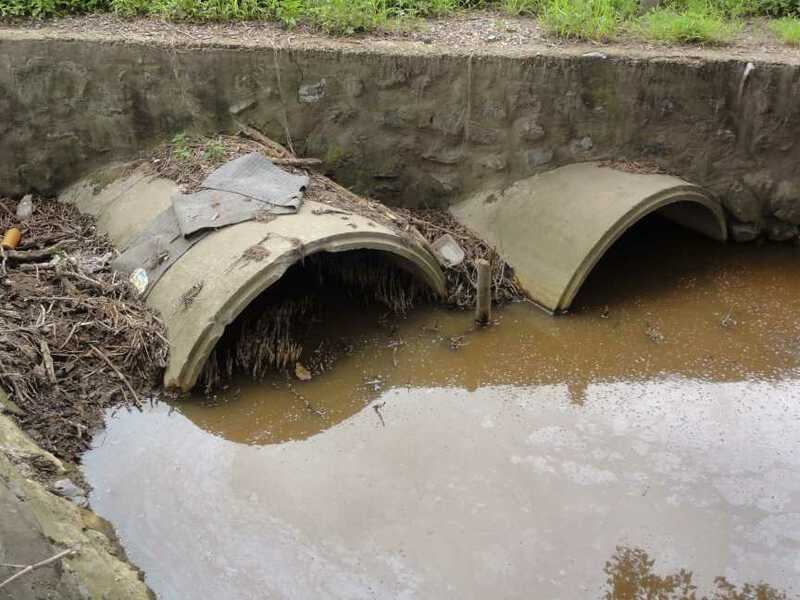 Brisbane City Council Documents show that the Brisbane City Council wants these pipes (3 by 1.5 metres pipe culverts) below upgraded to 3 by 3 metre by 1.800 metre box culverts. 4 Jan 1012 Mangrove Tree removed root ball still in pipe in September 2012. 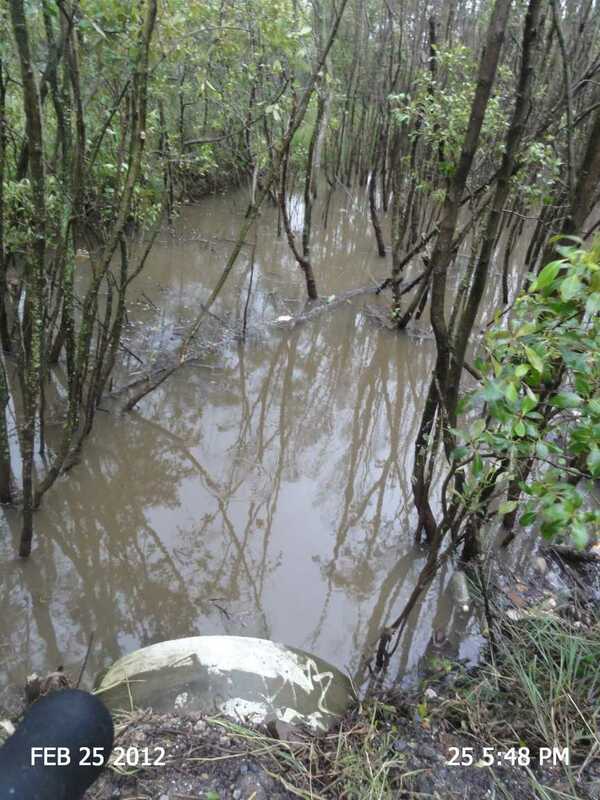 Just how many years of departmental neglect does it take for mangroves to become this well established in drain pipes? Maybe when the Transport Department brings in mandatory breath testing for workers they should also consider sight testing also. 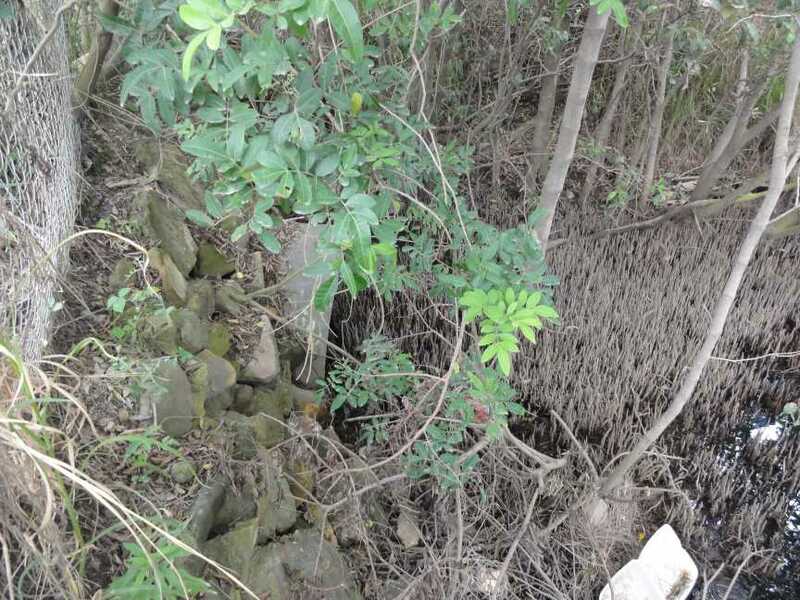 Above 2 photos taken 4Jan2012 mangroves gone BUT roots still blocking TWO drainage pipes. Met with TMR Asset Manager on this site on Monday 9 January. Explained situation and await remedy. 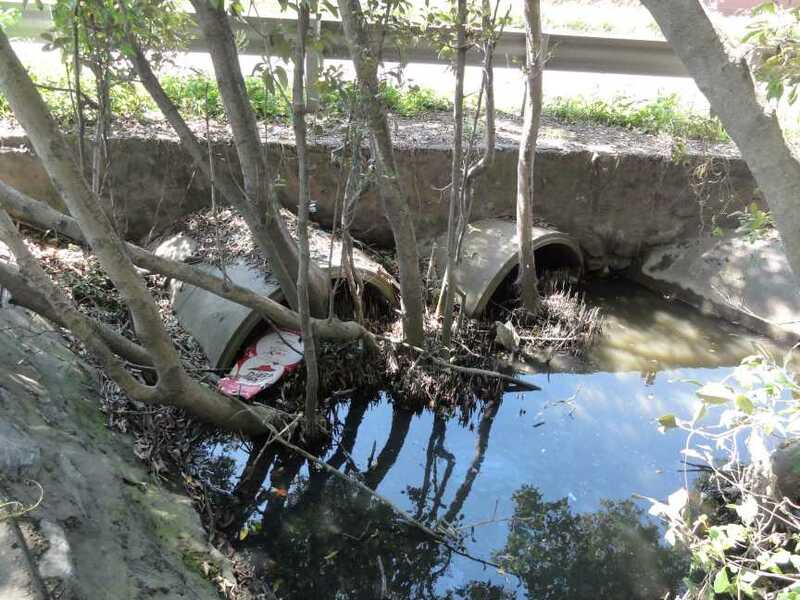 We are still waiting for Queensland Transport to clean this culvert 7 months later. Photo taken from private property about half way between Gosport Street and Aquarium passage August 2011. 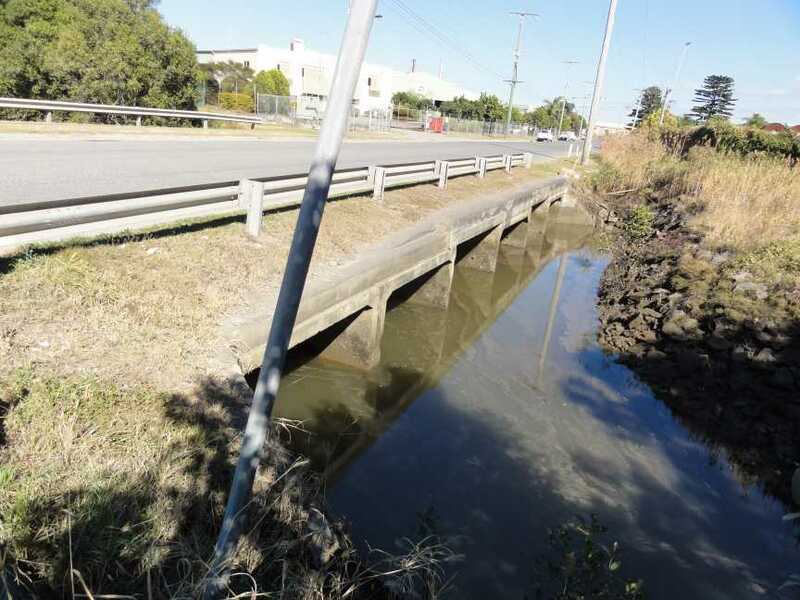 Mouth of Main Drain near the Bulimba Creek end of Aquarium Avenue. 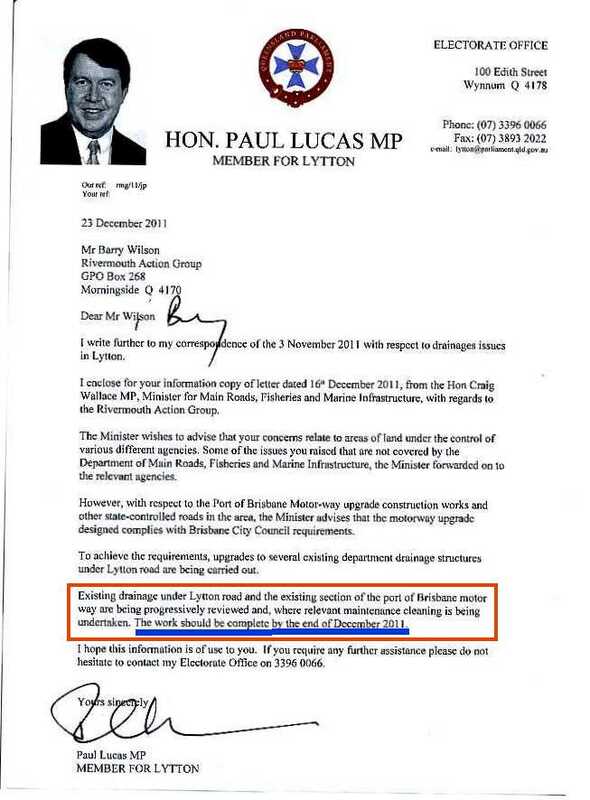 The Port of Brisbane Motorway development stage 2 is not to increase flooding by more that 10 mm increase. 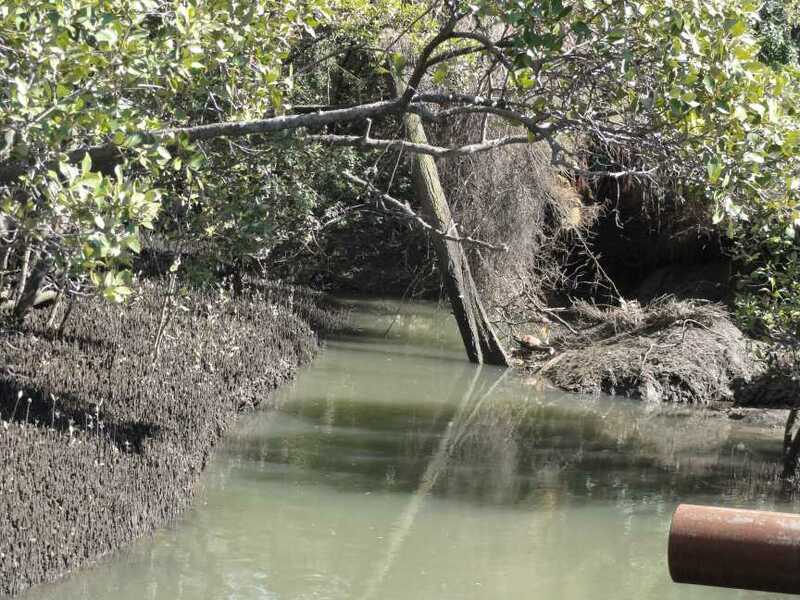 I wonder just how much of an improvement could be gained if all of the drainage channels were cleaned out and tidal gates reinstalled to stop salt water intrusion into what was once fresh water wetlands and thus the demise of the mangroves blocking up culverts and trapping sediment and reducing flow capacities along drainage lines. Yet 100's if not 1,000's cu m of fill are being places within the flood plain at Hemmant/Lytton for the construction of the Port Road duplication and extension yet Queensland Transport take no responsibility for the drainage channels which will now need to be even more efficient to cope with the future upstream development already in the approved stages. This is not good government nor good engineering or planning. Those engineers and planners responsible for this area should read the code of tenant they signed up to when they joined their professional bodies.